Rescued girl, Serah Luka, not on our list —Chibok parents - BlogIT with OLIVIA!!! 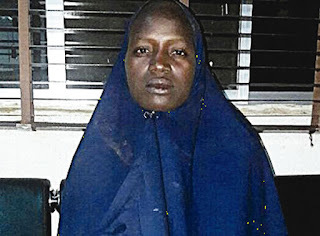 Chibok parents refuted the Nigerian Army’s report that the second rescued girl, Serah Luka, was among the 219 kidnapped by Boko Haram on April 14, 2014. A girl, Amina Ali, believed to be among the Chibok schoolgirls, was announced rescued from the hands of the terrorists on Wednesday. The army had again said in a statement on Thursday that its troops killed 35 Boko Haram terrorists and recovered several arms and ammunition in the recovery of Luka. The military statement said, “In addition, they rescued 97 women and children held captives by the Boko Haram terrorists. We are glad to state that among those rescued is a girl believed to be one of the Chibok Government Secondary Schoolgirls that were abducted on April 14, 2014 by the Boko Haram terrorists. However, the head of the Abducted Chibok Girls Parents group, Yakubu Nkeki, told Agence France Presse that unlike the first announcement about Amina, the military had not contacted them beforehand to establish Luka’s identity. “Only two girls with the surname Luka were on the list of abducted girls and none was from Madagali, in neighbouring Adamawa State, as the military said the second student had claimed,” he added. The military said Serah was believed to be a pastor’s daughter, but Nkeki said there were only four priests on the list of parents and none was called Luka.